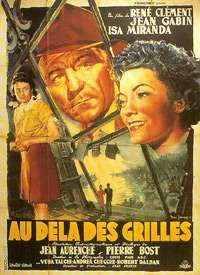 The Walls of Malapaga (Italian: Le mura di Malapaga, French: Au-delà des grilles (Beyond the Gates)), is a 1949 Franco-Italian film co-production made by Francinex and Italia Produzione. It was directed by René Clément and produced by Alfredo Guarini from a screenplay by Cesare Zavattini, Suso Cecchi d'Amico and Alfredo Guarini adapted by Jean Aurenche and Pierre Bost. The music score was by Roman Vlad and the cinematography by Louis Page. The film stars Jean Gabin and Isa Miranda. Gabin is a French criminal, Pierre Arrignon, on the run who finds himself in Genoa, Italy, and falls in love with a local girl, Marta Manfredini (played by Isa Miranda). The film is set in Italy but the dialogue is primarily in French. The Walls of Malapaga was highly regarded in its day: it won an honorary Academy Award for Best Foreign Language Film and both Clément and Miranda won awards at the 1949 Cannes Film Festival. ↑ "Festival de Cannes: The Walls of Malapaga". festival-cannes.com. Retrieved 2009-01-09.